More than a hundred works of the distinguished Belgian Post-Impressionist Louis Dewis, lost to the world for over 50 years, will be featured in Dewis’s first major museum exhibition beginning January 25th at the Orlando Museum of Art (OMA). Discovered by chance in the Paris attic of Dewis’s daughter by his American great-grandson, Mr. Brad Face, they were among thousands of the artist’s paintings, studies and sketches that had been stored there since his death in 1946. After this discovery, Mr. Face resolved to return his ancestor’s work to the public and find a home for the collection. “Art critics of the early 20th century European art world noted Dewis’s unusual ability to communicate his emotions through his work,” commented OMA Director and CEO Glen Gentele. “And that certainly has been what we’ve seen with our Dewis mini-exhibition (presented May 18 - September 9, 2018). This remarkable collection of Dewis’s work and the fascinating story of his life are not to be missed” continued Gentele. 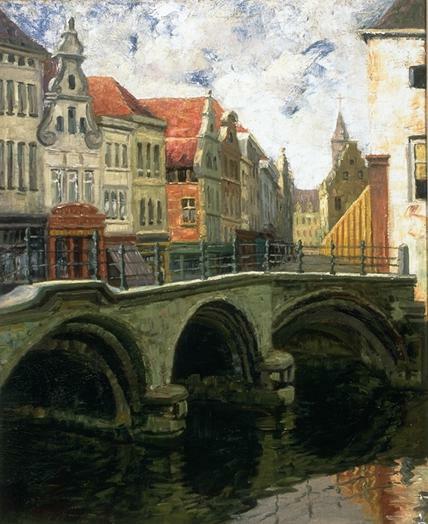 Louis Dewis, Dyle Bridge at Mechelen, Belgium, c. 1919-1921. Oil on canvas, 26 ¾ x 21 ¾ in. On loan from The Dewis Collection, LC. Image courtesy of the Orlando Museum of Art. Louis Dewis (1872-1946) was born Louis Dewachter in Leuze, Belgium. He developed an interest in art early in life but was discouraged from pursuing a career as a painter by his father. As a young man he entered the family business, Maison Dewachter, the world’s first department store chain. A successful and innovative entrepreneur, Dewis dedicated himself to growing the business while privately devoting time to his artistic development. He later adopted the pseudonym Louis Dewis to comply with his father’s insistence not to associate the family name with the younger Dewachter’s “frivolous” pastime as a painter. 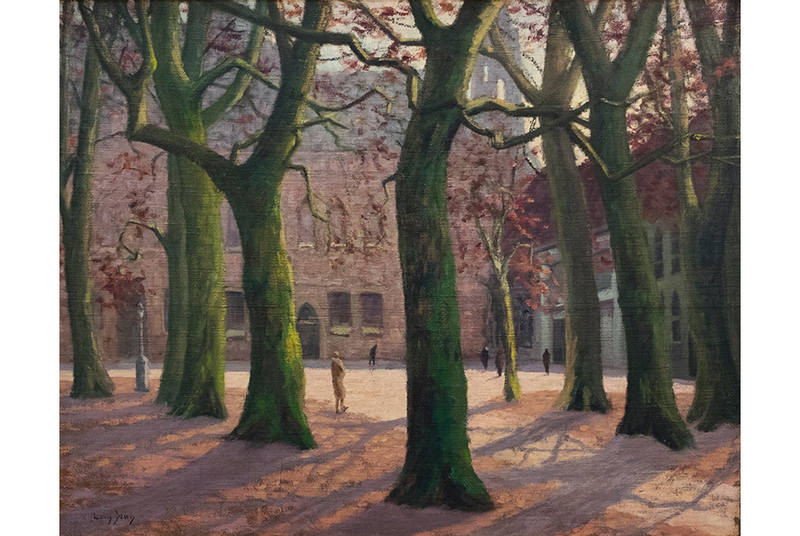 Louis Dewis, The Beguinage at Bruges, 1920. Oil on canvas, 31 ½ in x 39 in. On loan from The Dewis Collection, LC. Image courtesy of the Orlando Museum of Art. Following the death of his father, Dewis’s painting career began to take precedence over the family business. Living in Bordeaux at the time, he had his first public exhibitions there and was active in the city’s artistic life. At one of these exhibitions, he was discovered by the Paris art dealer Georges Petit. Petit was a leading dealer of the period representing at times such masters as Monet, Renoir and Rodin. Petit offered to represent Dewis, if he would move to Paris and devote himself to painting. In 1919, Dewis took Petit’s advice, selling his share of the department stores and moving to the French capital. Though Petit died a year later, Dewis went on to establish a successful career for the next two and a half decades. Dewis exhibited throughout France and Belgium in the 1920s and 30s, as well as in Germany and Switzerland. When the Second World War began, Dewis left Paris and settled in Biarritz on France’s Southern Atlantic coast. For the last few years of his life, the scenic coastal city and surrounding rugged countryside became the subject of his paintings. Louis Dewis: A Belgian Post-Impressionist will present landscapes from important periods of the artist’s career following World War I. The years immediately after the Great War were distinctive in French art for a return to the motif of landscape, which is reflected in the direction that Dewis pursued. In part a response to the unprecedented devastation of the country and staggering loss of life, many artists during this time sought to celebrate the “soil” of France in landscape painting. Working in the towns, villages and open countryside throughout France, these artists strove to depict the unique and varied regions that together comprised the cultural vitality of the nation. Following his death in 1946, Dewis’s daughter, Andrée Dewachter Ottoz, was intent on preserving everything related to his artistic career. She had the entire contents of his atelier in Biarritz packed and shipped to her Paris home. For 50 years much of Dewis’s work languished in storage and his career was overlooked by the art world of Post War France. Finally, through a chance conversation with her great-nephew, Mr. Face, the then 92-year-old Mme. Ottoz revealed the cache of paintings she had stored away for decades. Inspired by this astonishing discovery of the life’s work of a once prominent artist and family member, Mr. Face undertook the major commitment of caring for the collection and renewing public interest in Dewis’s career.